Yesterday we posted that the 1940 census images for the state of Illinois are ready to be indexed through FamilySearch. We encouraged you to select Illinois State Genealogical Society as your affiliated when setting up your indexing account. But how do you change the group when you already have an existing FamilySearch account? Follow these simple steps below to change your affiliated group. Open and log in to the FamilySearch Indexing software. Click on the Personal Info tab. Click on the link Change My Information. This will launch the FamilySearch website login. 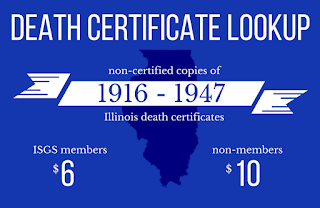 Under Additional Indexing Information, confirm that Group says Illinois State Genealogical Society. If it does not, click the Edit button. Choose Illinois State Genealogical Society from the drop-down menu to select a Group. That’s it! Now, not only will you receive credit for indexing the 1940 census, so will Illinois State Genealogical Society! Thanks for showing your support! Join us for our next FREE webinar!